The new 200 seat Quality Italian Steakhouse in its second story perch over the corner of 57th and Sixth Avenue can be seriously annoying. Not only the stairs or the warehouse elevator. Not just because painful noise churns off the unfinished concrete ceiling or your spine gets a shock if you drop into your unpadded chair too quickly. Did you come for an evening of steak house familiars and conversation with good friends? Forget it. First you need Ritalin to navigate dozens of starters you want, need, crave. And then your waiter hogs the stage. Did you think you were the star tonight? We're still waiting for the second c ourse - that's okay, we understand. It's very early on and the kitchen is, not surprisingly, slow. 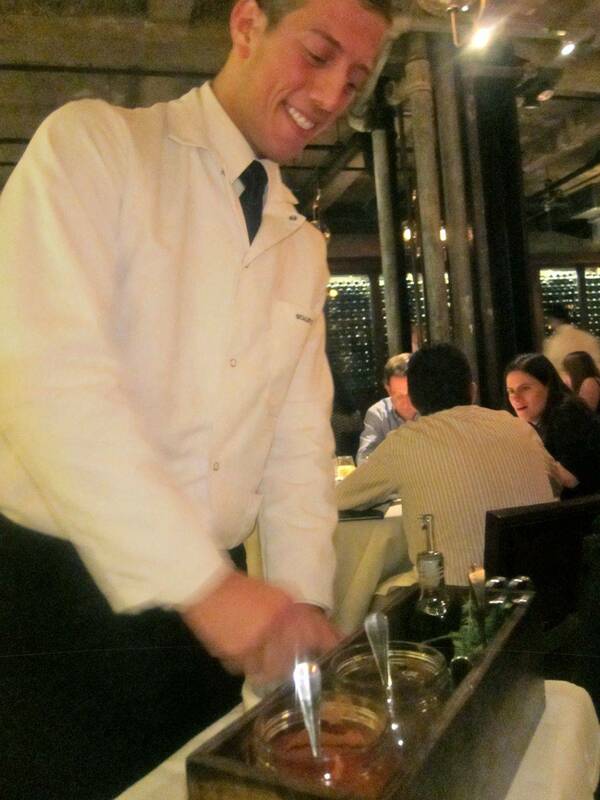 Here comes Andrew the waiter, toting a podium with many pots and jars that he parks tableside. "I am making your steak sauce," he confides. It takes not more than five minutes. The bowl he sets upon the table would feed a family in rural China for a week. Like trained seals, we taste. On the other hand, unlike me, you might find a little shtick amusing. Or like me, you almost forgive everything, because, amazingly, even this early, most of what we're tasting is really good. Starting with the amuse: Parker House-style rolls in their black iron baking dish, almost too hot to touch, salty and delicious. 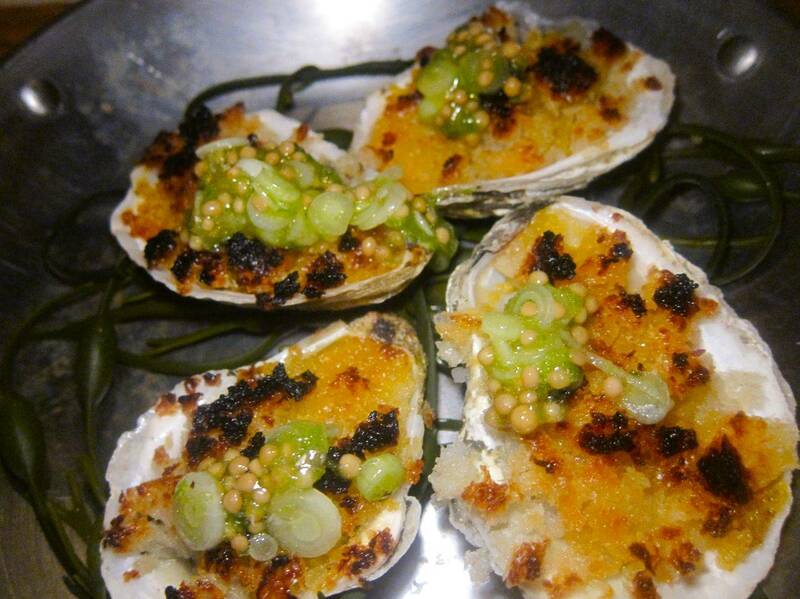 Oysters with bread cr umbs, scallion and sea urchin are marvelous. (I'm lucky some of my tablemates dislike uni and I don't have to share.) Crisp fried shallot rings add nutty crunch to the chopped salad -- a splendid toss of small charred pepper and onions, marinated mushrooms, pepperoni chips, oil cured olives and Parmesan dust. There are flubs. The point of a Caesar is crisp romaine and that salty anchovy dressing. We shouldn't have to ask for more sauce. 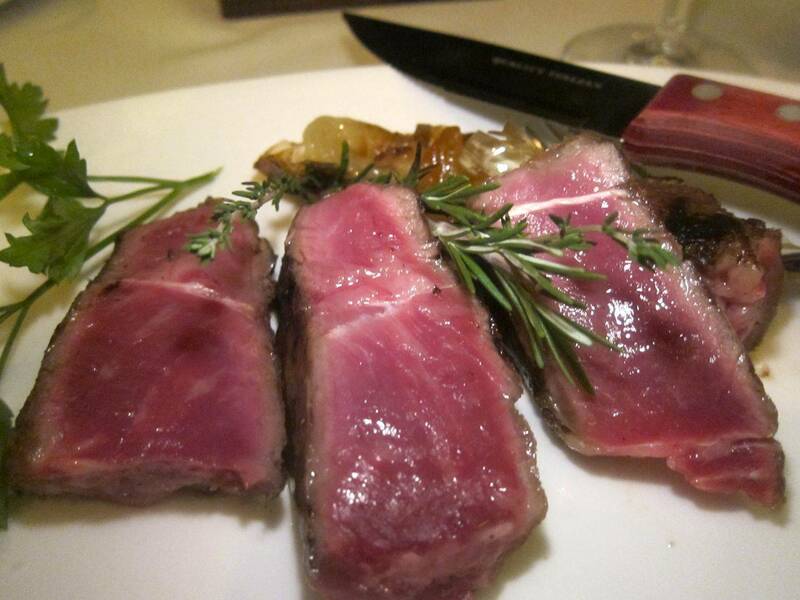 Tuna, marinated for 28 minutes, according to executive chef Scott Tacinelli, and lined up with curls of honeydew is meant to stand in for melon and prosciutto. Like the original, it's a safe choice for timid eaters, scarcely memorable. 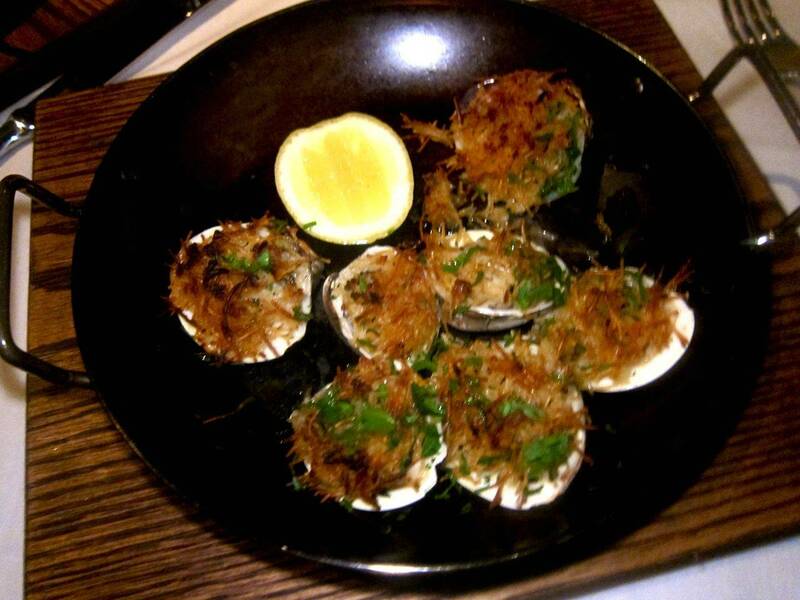 Chopped up noodles, panko crumbs and xanthan gum to thicken clam broth suggest s the chef's dedication to reinventing baked clams. Our eaters find something missing. They taste watery to me. We've already read raves about the house's $58 chicken Parmigiana for two, layers of juicy chicken with fresh-made San Marzano tomato sauce and house-dried herbs on a crumb crust, with Pecorino, Parmesan and mozzarella on top. Like the $50 veal Parmesan at Carbone's, it sits looking like a fat pizza on its metal stand. Pizza condiment jars are stashed below: hot pepper flakes, pepperoncino oil, black olive sprinkle and, here's that wild Stillman flourish, honey spiked with dried Calabrian chile. It's insanely rich and luscious. Five of us can't finish it. Once it finally materializes, the waiter boasts he's had no problem getting the $98 Porterhouse, half medium and half rare to suit divergent tastes. (The secret is slicing it in the kitchen where ha lf can go back on the fire.) Two waiters trail him with the sides, setting up tableside for show and tell. Like a high-flying Wallenda, he whirls about, distributing slices, spilling a swath of grease on the tablecloth. (Glad it was you, Andrew, and not me. A napkin will cover that up). Bottom line: my two slices are tender, really rare and delicious. Sides of macaroni are ubiquitous these days. But paradise for a penny-pinching noodler like me is Quality's baked pasta sides, three choices, each just $11. I keep passing the rigatoni and meatballs along not to overdose. A week later, artichoke with double curls of maccheroni, marvelously crumbed and crusty, keeps getting passed to me. I can imagine stopping at the bar after a movie sharing either one and a chopped salad for late supper. Corn br�l�e is such a hit at Michael Stillman's Quality Meats around the corner on 58th Street, that he had the chef bring it along. I'm spooning up the corn below but the topping's too sweet for me. Broccoli rabe has been oversalted. 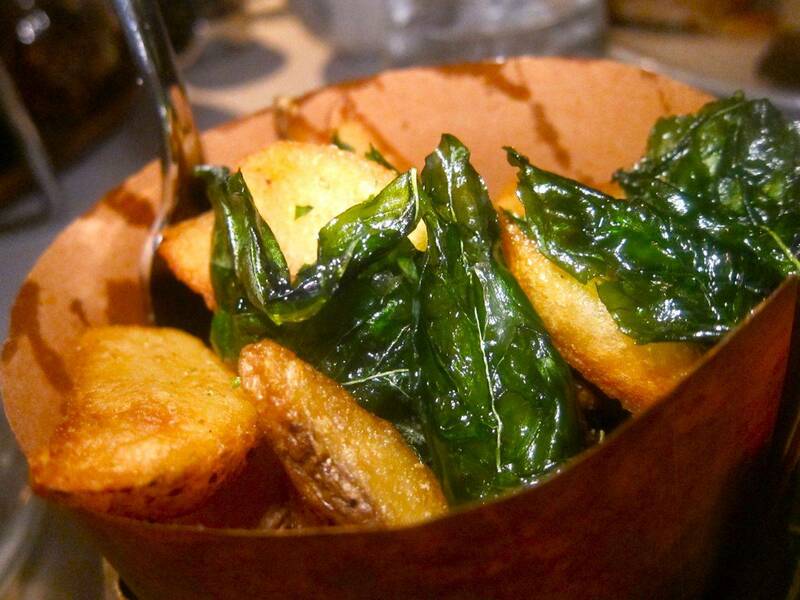 These Tuscan fries are fine but can't compare to the mythic fried-herb flecked beauties by Cesare Casella at Coco Pazzo. Order the "Zeppole Workshop" at your own risk. Just when you might be numbed by excess, it requires you to do up your own fried donut and pay $18 for the fun. Spill on the honey. Dip it in chocolate. Find your own mouth. Meanwhile, did someone say the word "cannoli?" The waiter has rolled up yet another laboratorio, this one with housemade pastry logs piled high. He slips on a white glove, like a gynecologist, and proceeds to inject sweet creams into a series of cannoli shells - blueberry, pistachio with syrupy cherries, and peanut butter drizzled with chocolate sauce. He's back with the $5.20 espresso to ask: "Which did you prefer?" It's about him. This tutto Italia menu doesn't seem aggressively expensive. Salads start at $11, corn gnudi at $15, housemade ricotta with honey for the table at $12, and sides are just $9 to $11. 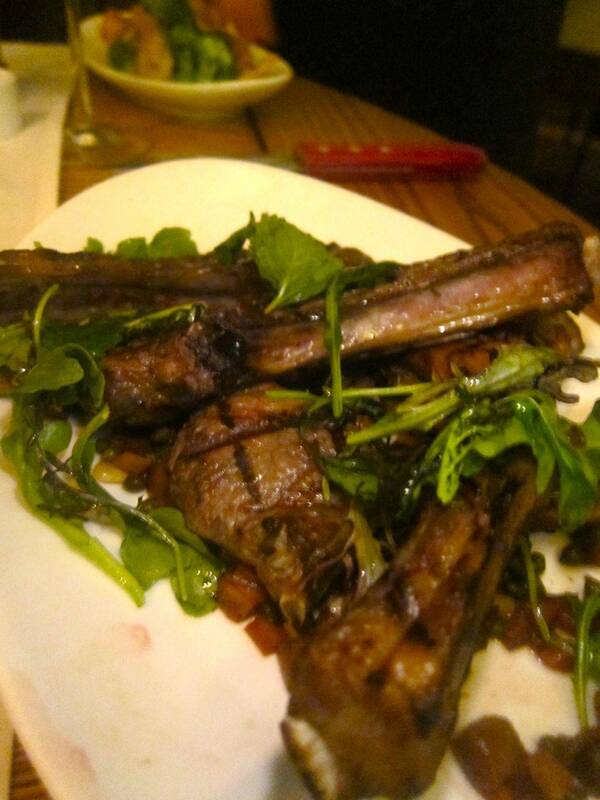 But appetizers climb to $19, and "The Mains go from $23 for chicken Alan to $48 per person for the Porterhouse. We've spent $90 each, with an extra tip for the kitchen's gifts and dinner has stretched over three hours. We agree it's too early to judge. Somebody suggests a restaurant might give a discount during "previews." Proud Papa Stillman stops by our table to say hello a week later. I had asked him for a spot in the quieter room overlooking the street. "Is it quieter?" he asks with a laugh. "You don't like what the kids like?" Actually it is quieter, especially at the old folks dinner hour of 7:15. By nine the decibels have multiplied as a waiter behind me flames lobster diavolo tableside and a six top shouts to be heard above the din. A real tablecloth or two might help. Again tonight's waiter is either running for class president or wants to sit down with us. He definitely wants to be my best friend. But the kitchen has found its rhythm. My companion actually needs the tableside steak sauce to jazz up her pork chop. It's plump and pink, sweetly tricked out with fried sage an d cherry saba but after a few bites, it needs some extra pizzazz. But Chef Tacinelli's savory eggplant caponata-like mix with olives, pine nuts, capers and bright green olives make her husband's "Lamb Chops Scottadito" a major triumph. Using big, juicy lamb from Colorado and delivering it rare, as requested, helps too. My bone-in sirloin ($45) emerges truly rare, shockingly tender and delicious. Two of us are sharing it, but given half a dozen sides and my weakness for the irresistible maccheroni - a third of the steak is left. Even the sunchokes - roasted, flattened and tossed with cheese and olive oil aioli - demand attention. Did we order sunchokes? "It's my favorite side," says our waiter. "It's my gift to you." My friends agree on the lemon meringue tart as a single dessert. Then inevitably the cannoli cart arrives and yet another waiter dons a white glove. I can't promise your pastry prince will appear unbidden. That could be meant to melt a recognized critic's heart. 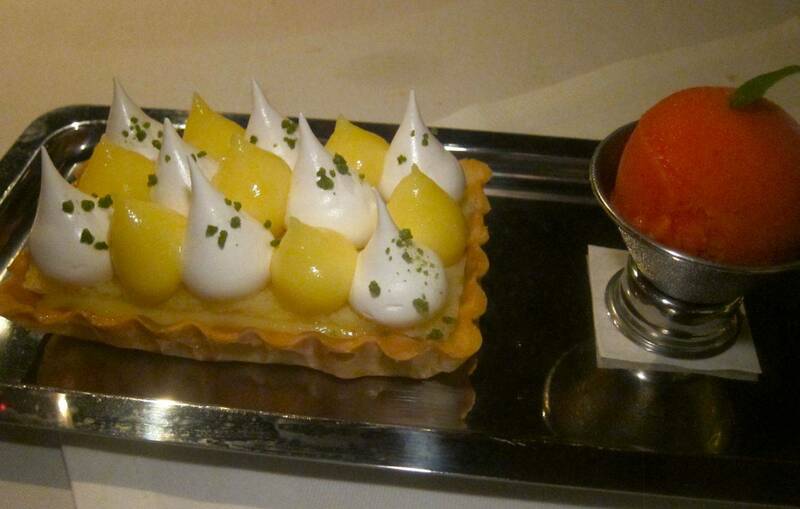 But order the lemon tart anyway. It might come with blood orange creamsicle sherbet alongside. Ours did. Tangy finale. The owners of 57 West 57th had been trying for years to glamorize the former M edical Arts Building, according to Steve Cuozzo's report in the Post. Then the Staples' lease expired and the Stillmans came along. They saw that while a ground floor restaurant would cost three million a year, they only needed a bar-caf� on the Sixth Avenue side to lure their crowd to the space upstairs. Now as he gazes out the window at the wildly successful Rue 57 on the opposite corner of Sixth Avenue, Stillman grins, anticipating the lunchtime swarm. 57 West 57th. Entrance on Sixth Avenue between 57th and 58th Street. 212 390 1111. Cocktails from 4 pm. Monday through Saturday 5pm to midnight. Sunday till 10 pm. Lunch soon. For our colors today, what else than the red, white and green of the Italian flag? Photographs of the marvelous chicken Parmigiana, our waiter blending steak sauce, oysters with sea urchin and scallion, the fine bone-in sirloin, baked clams with a twist, the essential rigatoni with meatballs, Tuscan fries, surprising lamb chops caponata, and the signature lemon meringue tart may not be used without permission from Gael Greene. Copyright 2013. All rights reserved.